The Jury mast knot (or Masthead knot) is traditionally used for jury rigging a temporary mast on a sailboat or ship after the original one has been lost. The knot is placed at the top of a new mast with the mast projecting through the center of the knot. The loops of the knot are then used as anchor points for makeshift stays and shrouds. Usually small blocks of wood are affixed to, or a groove cut in, the new mast to prevent the knot from sliding downwards. 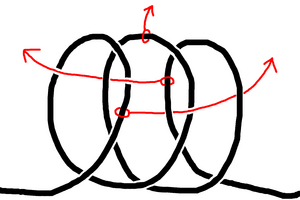 There is contention among knot researchers whether this supposed rigging knot can work as described. Due to a lack of hard historical evidence there is also uncertainty whether it was ever commonly used for rigging jury masts. Despite these questions, the knot continues to be recommended for jury rigging purposes in modern nautical texts. There are three closely related variations of this knot. They differ based on the type of crossing, overhand or underhand, of the three initial loops and then whether the edges of each loop is positioned over or under the previous one. Although these knots are tied in the bight, for the purposes of description the left side will be considered the standing part. If all the crossings and overlays are reversed, or the right side is taken as the standing part, a mirror image of the knot will result. This variation grips the mast best in the absence of other means to prevent the knot from sliding downwards. The pattern of this variation, from the left, is: under-under-under/over-over. This variation is the simplest of the three in structure (though not in tying) and lends itself to being reinforced by tying a reef knot with the two free ends. The pattern of this variation, from the left, is: under-over-under/over-over. According to Ashley this is the preferred variation. The pattern of this variation, from the left, is: under-under-under/under-under. ↑ Clifford W. Ashley, The Ashley Book of Knots (New York: Doubleday, 1944), 212. ↑ United States Power Squadrons, Knots, Bends, and Hitches for Mariners (Camden: International Marine, 2006), 65-67. This page was last edited on 9 December 2009, at 20:00.